R–NHC coupling was previously considered as a process of degradation of M/NHC species, however recent studies have pointed out that it may be responsible for generation of catalytically active NHC-free complexes or/and metallic nanoparticles. Therefore, a detailed and systematic study of R-NHC coupling for various carbene ligands is an important topic. In the present article this process has been studied for reactive aryl iodide coupling partners by a combination of quantum chemical calculations and continuous reaction monitoring via pressurized sample infusion electrospray ionization mass spectrometry (PSI-ESI-MS). 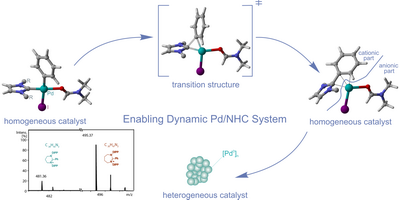 DFT calculations revealed strong tendency of (NHC)Pd(Ph)(I)DMF complexes bearing various N-heterocyclic carbene ligands (NHC) to undergo Ph–NHC coupling. Calculated energy barriers of these reactions lie in the range of 17.9 – 25.1 kcal/mol. Ph–NHC coupling is thermodynamically more favorable for the complexes containing unsaturated NHC ligands with bulky substituents. NBO analysis has suggested that the process of Ph–NHC formation is similar for different NHC ligands. In order to confirm theoretical studies, a series of ESI-MS reaction monitoring experiments was performed for (NHC)Pd(I)2(Py) and (NHC)Pd(Cl)(?3-1-Ph-C3H4) complexes interacting with iodobenzene, where Ph–NHC coupling products were observed in all cases. As a direct experimental evidence, formation of colloidal Pd-containing nanoparticles was observed in situ for different Pd/NHC complexes in the studied reaction mixtures.